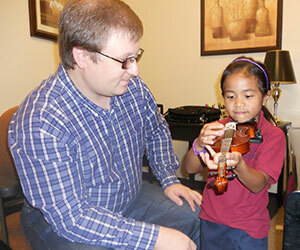 How old does my child need to be to take violin lessons? A reputable store will know how to measure a student to determine the appropriate sized instrument. Some stores where you may rent a violin include Music & Arts (several locations in the metro area) and Howren Music (Park Road Shopping Center). Where can I purchase or rent a violin?